He is here, our Franz Liszt, the wandering knight of all possible orders (excepting that of the French cross of the Legion of Honor, which Louis Philippe will not give to any virtuoso); he is here, the Hohenzollern-Hechingen Court Councilor, the Doctor of Philosophy and of double quavers, or of all imaginable crotchets, the miraculous Doctor of Music, the again-arisen rat catcher of Hameln, the new Faust, who is always followed by a poodle in the form of Belloni, the ennobled and yet noble Franz Liszt! He is here, the modern Amphion, who by the sound of his chords set the stones for building the Cathedral of Cologne in motion so that they came together, as did those of the walls of Thebes! He is here, the modern Homer, whom all Germany, Hungary, and France, the three greatest countries, claim as their native child, while only seven small provincial towns contended for the singer of The Iliad! He is here—the Attila, the scourge of God for all the pianos of Erard, which tremble already at the news of his coming, and which now once more are convulsed, bleed, and wail under his hands, so that the Society for the Protection of Animals really ought to look after them! 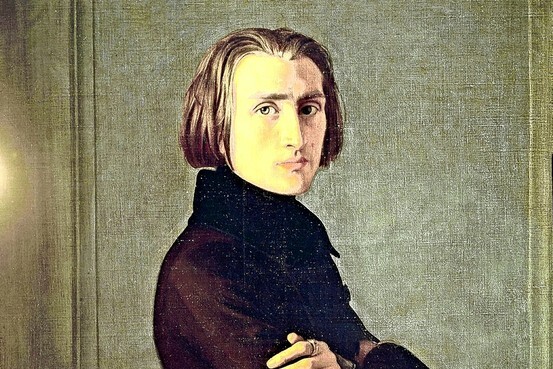 He is here, the mad, handsome, ugly, enigmatic, terrible, and often very childish, child of his time, the gigantic dwarf, the Orlando Furioso with the Hungarian Sword of Honor, the soundly well-today and ill-tomorrow Franz Liszt, whose magic power compels us, whose genius enchants us, the genial Jack Fool (Hans Narr), whose nonsense bewilders our own senses, and to whom we will in any caseshow the loyal service of making known the great furor which he is here exciting. We confirm candidly the fact of his immense success, but in what manner we interpret this fact according to our own private opinion, or whether we accord to, or withhold our private approbation from the distinguished virtuoso, will probably be to him a matter of the utmost indifference, seeing that our voice is only the voice of a single individual and our authority in the art of music is of no remarkable importance. Throughout the 19th century, “The Star-Spangled Banner” was regarded as the national anthem by most branches of the U.S. armed forces, but it wasn’t until 1916, and the signing of an executive order by President Woodrow Wilson, that it was formally designated. Then in March 1931 Congress passed an act confirming Wilson’s presidential order, and on March 3 President Herbert Hoover signed it into law. 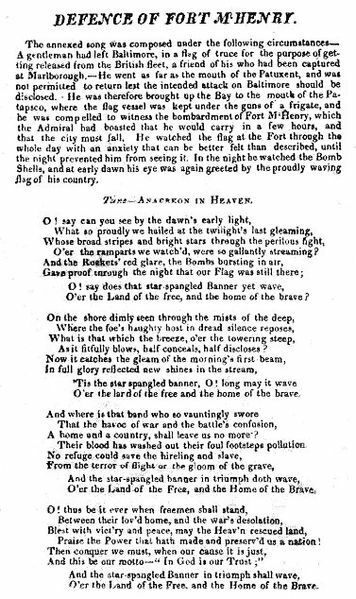 A 1814 broadside printing of the “Defence of Fort McHenry,” the Francis Scott Key poem that was later set to the tune of John Stafford Smith’s song, “To Anacreon in Heaven,” to become “The Star-Spangled Banner,” the national anthem of the United States.